Fitness and health tend to be a recurring resolution year after year and it is is one of those goals that tend to fall through the wayside because of the many excuses: time, not knowing how to cook (yup I’m admitting it😝), not knowing enough about food to make the right choices, not knowing what workouts to do, etc. This year that goal showed up on my resolutions list… again… BUT this time it carried much more importance because I’m still breastfeeding, therefore I would like to eat healthier for my son and let's get real, I am trying to get my pre-baby body back! Those excuses I would always use pre-baby (especially time) feel REAL this time around, but thankfully, I was introduced to Meal Prep Sunday San Diego a meal prep service (here in San Diego) that customizes a meal plan and fitness guide to each client. Now, before I jump in, I want to preface this by saying that this is an intro blog post about me embarking on this health & fitness journey and adopting this meal prep service in San Diego as part of it, but I will be back with another one sharing my experience and progress because as that saying goes "it's not a sprint, it's a marathon"! How it works: In a nutshell, clients fill out a questionnaire on their Meal prep service San Diego website and based on all the data collected their algorithm will generate a personalized meal plan and work out plan. From there, you choose how many meals you wish to receive a week. It can contain up to breakfast, lunch and dinner, marked neatly at the top letting you know what day to eat it, something I find super convenient! 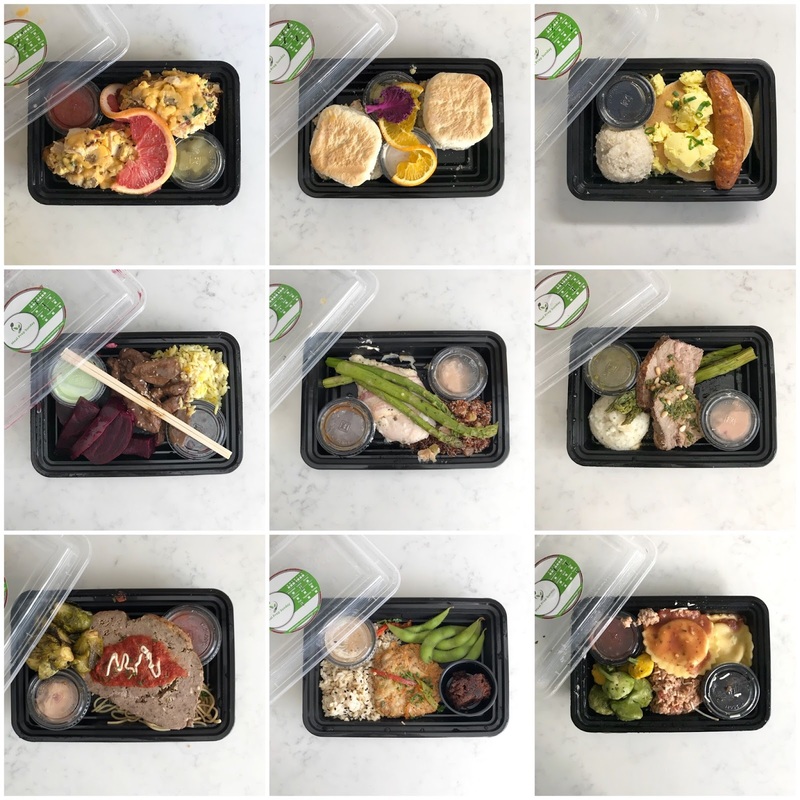 Every week the menu changes, so you won't get bored of the same stuff over and over, and all of the details about your customized plan: meals and fitness plan get sent to you. And then every Sunday just like clockwork there is a fresh delivery at your doorstep, which I am just in awe of! You might have seen me share my meal prep on my Instastories as I put my meals away neatly in the fridge. I’m going on my third week of meals and I have been doing the breakfast, lunch and dinner M-F plan. There are so many reasons why I'm really enjoying this Meal Prep Service in San Diego, but I'll narrow it to just 3 that are important for this new mommy. 1) I can affirmatively say that aside from healthy the food is very tasty. I found myself eating veggies that I wouldn’t eat before- I like that the meal forces me to eat asparagus, broccoli, sweet potatoes, etc. and I actually like it *gasp* 2) Convenience and being able to eat on the go. Now that I have returned to work, I can easily bring my breakfast and lunch and when I get home exhausted I can just pull out my dinner. I used to make the WORSE food choices when I was hungry and refused to cook something healthy! 3) That the plan is customized to me on a personal level. And so I'll leave you with my experience thus far, but will return with more about the progress. If, however, you are interested in this Meal Prep Company in San Diego, check out their website, https://mealprepsundaysandiego.com and if you use the code "lilbitsofpau20" you'll get 20% off the first order!